Designed to be quick and easy to both apply and buff off in all weather conditions, including bright sunlight, it gently removes old wax and grime from the paint surface whilst adding oils to weathered paint to refresh the colour. 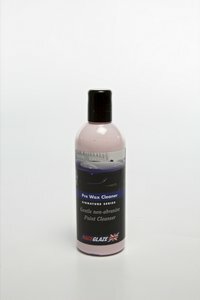 It is NON-ABRASIVE and dust-free, leaving a clean surface with a fine glazed surface for very temporary protection that allows fine waxes like our 42 and 55 to effectively bond to your paintwork. Its use is recommended even on freshly painted cars as bodyshops and dealers often use low grade short-term polish requires removal. A 250ml bottle should prepare around 5 average sized cars and is substantially cheaper than alternative products.